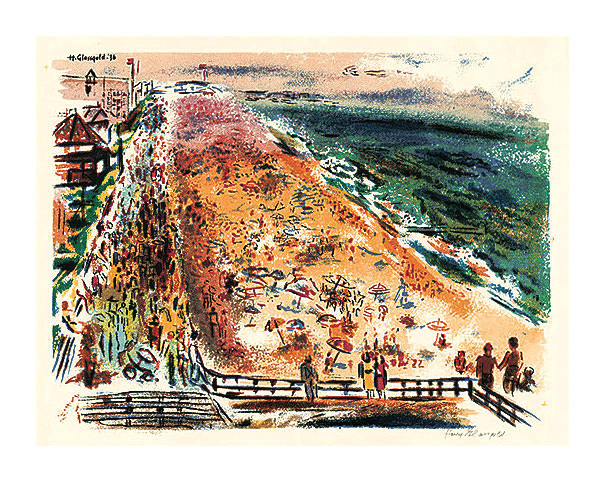 Rockaway Beach, NY - - 1936, Color Serigraph. Edition 250. Signed and numbered 243/250 in pencil. Signed and dated in the screen, upper left. Image size 13 5/8 x 17 7/8 inches (346 x 454 mm); sheet size 20 x 26 inches (508 x 660 mm). A fine, painterly impression with fresh colors, on cream wove paper; full margins (2 1/4 to 4 inches), in excellent condition. After a watercolor by Glassgold now in the Detroit Institute of Arts. Published by Regional Art Editions.